Japonaiseries? You must be wondering what I’m talking about. This is how I’m calling my two latest tops. It all started with a fabulous fabric I got a couple of weeks ago. with just a hint of silvery glitter. At 4€ a metre, I couldn’t pass it up! The first top is the result of my second experience with an Onion pattern. This is Onion 2017. It went together like a charm (although the neckband could do with a little less ease. I’ll remedy that for the next top). It feels lovely against the skin. This is a top I’ll be wearing a lot. I can pair it with jeans to chill out in the evening, or with more formal black pants to go to work (or grey, or red, of course, but I haven’t either). It has a tie in the back, but I didn’t manage to take a good picture of it. Sorry! I hereby officially declare myself an Onion fan! (although, this may sound weird, out of context!) Can’t wait to get and try out another of their patterns. Another funny oops with the camera – there was too much sun (for the camera, that is. Never for me!) and the light erased my face; it does shows the line of the top well, though. ETA: You can now read a more technical review here. 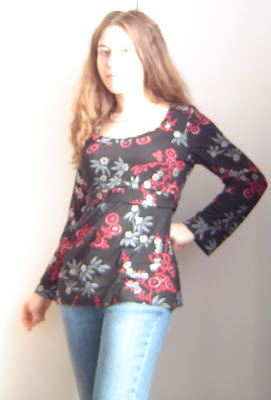 I’ll show you the second top as soon as I’ve managed to make pictures… It is Simplicity 4020. Another winner! Best of all? I still have enough fabric to make a skirt or a small top. Just have to decide on a pattern. … Sometimes it’s good to be small! nice top! it suits you very well! FABULOUS, Isabelle!!!! Now I must try out an Onion pattern too! You are so inspiring!PS – I might be spending 4 days in Paris!! I’m not sure yet but I’ll let you know!BIG hus to you, my friend! Beautiful! I love that top and the fabric! Well done, it is lovely. Ca te va super bien!! et le tissu est très joli! 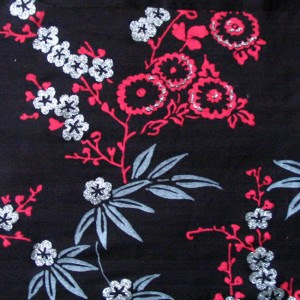 Beautiful fabric, and it looks just great on you!! Isabelle, that top looks wonderful! Good work, kiddo. Very cute! I must try Onion sometime. Yes, being small can be advantageous! What a cute top! You put these together so quickly and so well!Ava is doing well, by the way. I got some of one of her meds all over her face last night (darn plunger thingy), and she was a bit ticked off at me and slept elsewhere. But otherwise, it appears to be clearing! I will take her to her regular vet on Friday for more info 🙂 Thanks for all the well wishes and hugs for her! You are SUCH a great seamstress Izzy! The top is beautifull.I just finished a pair of pants and a shirt. Will show pics after the weekend. Hope one of the girls will take a pic of me. Beautiful top, I love this pattern, it suits you so well. Just had to delurk to say that is a gorgeous top and the fabric is stunning. Reading your blog is inspiring me to give sewing clothing another try. This looks wonderful on you. I love the fabric and can just imagine how it must feel. I love your new top! THe fabric is fabulous!! Hello my dear friend !Oh, what a beautiful top, I simply love the pattern and the fabric. And you look fantastic in it !I wish you a good week-end, and … oh, the sun is just rising and I can see it from my windows (I’m already at work because of the lake of trains …), it’s colorful and warm!I send you a ray of light for your day, and a kiss. I found your new blog 🙂 Your sewing looks always wonderful, what a lovely top! Thank you for your visit in my blog and kind words! Je peux lire anglais ou francais, mais j’aime bien pratiquer mon francais 🙂 J’ai habité deux ans en France, 30 minutes de Paris 🙂 Et les magasins de tissus de Montmartre me manquent beaucoup quand je lis ce blog 🙂 Bon week-end!